It’s a strange piece, this circle of color with its missing center. Hollowed out, the rim of tinted clay seems to have been robbed of its energy as it passively hangs on the wall. The ripped-out piece of crumpled clay lying on the floor, on the other hand, seems to continue effervescing heat from within its core, almost as if being separated from the rim has granted it more power. Laws of thermodynamics come to mind: Energy is neither created nor destroyed, but simply converted from one form to another. This seems pertinent when observing Brie Ruais’s Perimeter With Crumpled Center (2013), and noting the exchange of energy between the wall-mounted ring and its discarded center. Brie Ruais, “Perimeter with Crumpled Center,” 2013. Pigmented clay, clear glaze, hardware. Wall-mounted ring: 70 x 72 x 5″; floor piece: 22 x 21 x 13″; floor piece: 18 x 11 x 7″. Courtesy of the artist and Nicole Klagsbrun. Photo by Cary Whittier. Clay, worth Ruais’s weight, went into the making of this piece. 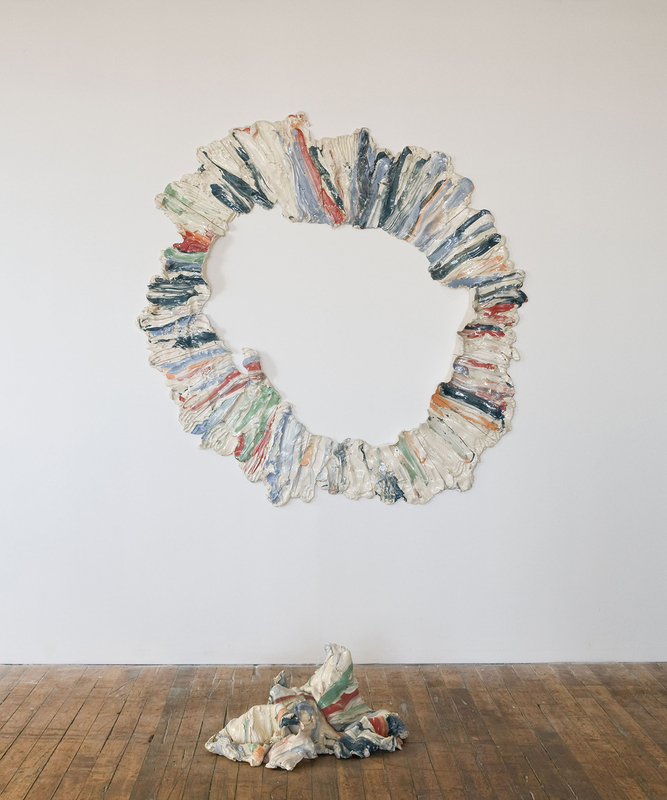 And while the weight of this piece doesn’t register when one is looking at it—a fragile, pleated ring, made out of strands of color seeping into one another, while the whole appears as if it can simply be folded away like fabric—the mass certainly plays a big part in the way Ruais shapes her work. The transaction of energy within her work is most likely reflective of a similar reciprocation between her and the material she uses to create life-sized works, mostly by applying her entire body’s weight to a mass of clay. Rolling, punching, kicking, stretching, folding, scrunching: Ruais’s aggressive use of her body in the creation of her work has evoked several comparisons with Bruce Nauman’s performance pieces. A clear set of rules or guidelines establishing the form or action to be associated with each piece, alongside a repetition of movement and a structural breakdown of the work itself (Ruais cuts each piece into tiles before she fires the work in a kiln, then reassembles each piece, tile by tile, at the exhibition site): all nod towards the gestural sensibilities employed in performance artworks. What makes Ruais’s work so engaging is this dialogue between the still and the moving. An ancient way of object-making, combined with a more contemporary discernment of movement, results in a piece that stays fixed in a spot yet pulsates with life as it tantalizes the eye with its endless bends and curves, edges and bumps; all imprints of a body in its desire to make itself a part of matter, and thereby also make itself matter.